This bouquet of long stem mixed roses will be the perfect way to send your love for any of life's special occasions! 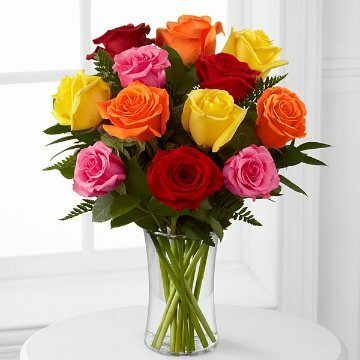 A dozen of our finest 16-inch assorted roses are brought together to form a rainbow of color that creates a gorgeous way to express your sweetest sentiments and appreciation, making it the perfect gift for a birthday, anniversary, to say congratulations or to send your get well wishes. Farm fresh flowers are shipped in a box for next business day delivery and includes clear glass vase.